Bullying doesn’t just occur within the school gates: it takes place online, in workplaces and beyond. Research released by The Diana Award today shows that when it comes to tackling bullying, everybody has a role to play. • 55% said they have experienced bullying while at school. • 69% who have experienced bullying at school said their confidence has been affected as a result of this experience. • 81% agreed with the statement “Bullying is commonplace online”. This shows that standing up to bullying is more important than ever. Bullying can make young people feel upset, uncomfortable and unsafe – and it’s clear that the negative impact can stretch long into adulthood. Join us to Stand Up To Bullying on 13th June. Of those surveyed who said that they had experienced bullying whilst at school, 65% said that their self-esteem had been affected as a result, 46% said it had affected their ability to be happy with who they are, and 37% said the bullying had affected their mental health. This was particularly prominent amongst those not in full or part time work, 55% of whom said their mental health had been affected as a result of their bullying experience, compared with 36% of adults in work. That’s why we believe it’s crucial for everyone– young people, organisations, teachers, friends, colleagues, MPs and society as a whole – to stand up to bullying. On Wednesday 13th June we are marking Stand Up To Bullying Day: a day in which everyone comes together to say that wherever you are, whether online, in your place of work or at school, you will stand up to discrimination and harassment and promote a culture of kindness, inclusion and tolerance. It’s a chance to reflect on how you will be an upstander , not a bystander, to bullying. That means calling out unkind actions wherever they take place, reporting comments online that don’t looks right and creating a kind community that will speak out and stand up to bullying. The campaign is powered by The Diana Award and we are proud to have the support of other anti-bullying organisations, MPs, celebrities, businesses, schools and members of the public who are joining us to celebrate the day. 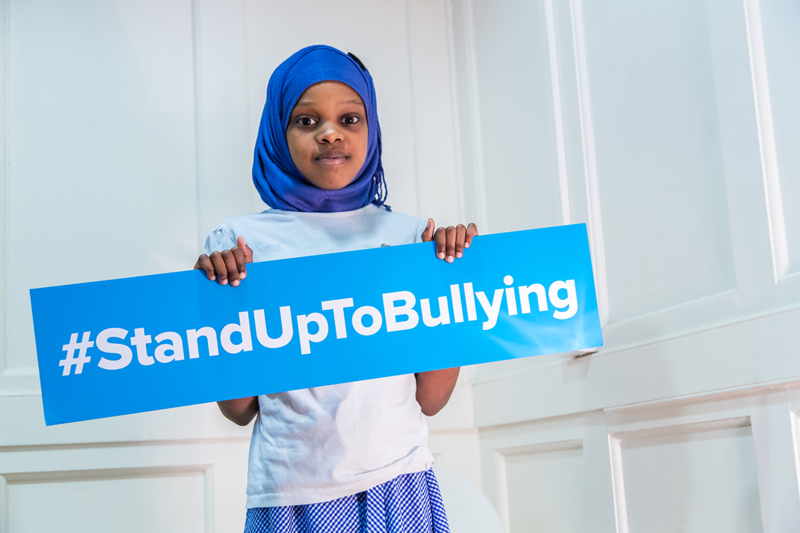 As part of Stand Up to Bullying Day, The Diana Award is encouraging organisations to get involved by promoting their workplace anti-bullying policy. Our findings indicate that this is more important than ever, with over 1 in 4 adults (30%) saying they believe that bullying occurs at their current place of work. Our survey also found that the vast majority of respondents (84%) believe that bullying is commonplace in schools. That’s why we are sharing interactive resources for schools to help them make sure that the 11,000 hours that young people spend in school are happy, safe and bully-free. Whether you’re at school, at work or just want to show your support, you too can get involved on social media using the hashtag #StandUpToBullying. We’re asking everyone to share how they’re choosing to #StandUpToBullying in five words, so feel free to get as creative as possible and help us create a community of kindness this June.